The Ontario NDP leader said Hamilton could use the $1 billion LRT funding on another transit-related project, triggering a sharp backlash from Hamilton LRT supporters. Ontario NDP leader Andrea Horwath provoked a crisis among Hamilton light rail transit (LRT) supporters yesterday at a Hamilton Spectator editorial board meeting. Horwath has supported LRT consistently since the project was first proposed in 2007, but yesterday, with no advance notice, she suddenly stumbled into a local political faultline when she opened the door to using the LRT capital funding on an alternate plan. The NDP leader and Hamilton Centre MPP said while she would personally prefer to see an LRT system in Hamilton, she said an NDP government wouldn't force city council to build it. Instead, she says that council could use the $1 billion earmarked for LRT on any transit-related project. "The reality is, the province shouldn't be deciding what municipalities choose to do with their transit systems," she said. "I would cry; I would be unhappy; it would make me sad, because I'm a supporter of the LRT and always have been - but it's important to acknowledge that the municipal order of government has these responsibilities in terms of envisioning the transit projects for their cities." Immediate comparisons were made to Progressive Conservative leader Doug Ford, who said on March 27 that he supports Hamilton LRT "because the people [of] this great city deserve a working transit system" that "will create jobs, countless new jobs and stimulate economic development," only to switch gears a week later and promise that if Hamilton doesn't want LRT, we would still get the $1 billion investment to spend however we want. The NDP campaign went into immediate damage-control mode, and Horwath issued a follow-up statement to reaffirm her support for the LRT project. "I want to be completely clear: I support the Hamilton LRT project and I'll fight like hell to make it happen." The statement notes that the NDP platform is to build LRT and that "there have been more than 60 votes approving the project over the past ten years. The position of Hamilton city council is clear. The position of Hamilton families is clear. LRT is the best way forward." Left unsaid in the statement is how an NDP government would respond if City Council does vote to reject and cancel the LRT plan, which is already well underway. Will the City have to reimburse the $100+ million that Metrolinx has already spent or committed to this project on the basis of Council's approval? Detailed design work has been completed, real estate agreements have been signed, and a Request for Proposals (RFP) has already been issued for the construction. Will the City have to develop a new transit plan and submit it to the province for funding? This seems like an absolute bare minimum requirement of responsible governance. It took five years for the City to develop its current LRT plan to the point where it was ready to submit to the province. Could the money be used to pay for express buses and local transit? This would represent a dramatic shift in how transit is funded in Ontario, and a new campaign pledge that is not included in the NDP platform. If not, what are the parameters under which the NDP would approve a new transit investment plan? RTH has posed these questions to the NDP campaign team and will report if and when we receive a response. I want to be completely clear: I support the Hamilton LRT project and I'll fight like hell to make it happen. Our city is growing. And we need a transit system that will drive our economy forward and improve the quality of life for Hamiltonians - and make our days and commutes smoother. 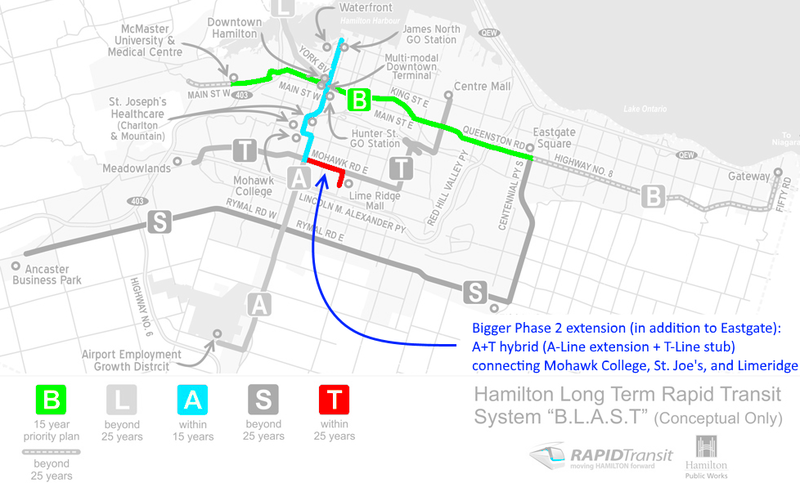 The Hamilton LRT project will be a vital part of that transit system. That's why I have been an outspoken advocate for this project for two decades. As a Hamilton city councillor, I championed light rail as the best transit option to support growth and vibrancy in our city. Both as an MPP and as Leader of Ontario's NDP, I have gone to the mat again and again in support of the LRT. I've pushed the Liberal government to provide clear confirmation of the province's support for the project and pressured them to commit to the secure funding that was necessary to see it through. I fought them when they decided to truncate the east end of the line and delay the start of construction. Should Ontario people elect me to serve as premier, my position will be no different than it has been for the last 20 years: Hamilton is getting an LRT, and there will be no more delays. It's right there in my platform - in black white and orange - "we'll build Hamilton's long-awaited LRT. Waffling on this project equals more delays on this project - and Hamilton can't wait any longer." We've set aside $1 billion to get shovels in the ground right away. There have been more than 60 votes approving the project over the past 10 years. The position of Hamilton city council is clear. The position of Hamilton families is clear. LRT is the best way forward. This city has long needed a partner at Queens Park with the courage to get the Hamilton LRT project moving. I promise to be that partner. Q: Andrea, can I briefly circle back to LRT? I don't think I've heard your view of Doug Ford's, uh, proposal that Council rejects LRT but can use the billion dollars for other infrastructure - whatever other infrastructure project it wants. What is your view of that? Horwath: I wonder how many other cities are going to get a billion dollars to do anything they want with, is my approach. (laughs) And I mean, this is - so, first of all, the billion dollars is for transit, and it's a commitment I've made, uh, in the last election, actually, and I've continued to stay committed to that. If the city wants to change its transit plan, I'd still be talking about how we could support that with that money. And so, but from my perspective, this is, this is, uh, um, this was a promise that came out of transit visioning and transit decisions that the City Council eventually made. Um, and so, from my perspective it's about transit. When it comes to things like finding ways to help the city with other costs, absolutely. And that's why we're talking about the operating costs of transit, and that's why we're talking about social housing, and, uh, and supportive housing, and other pieces that help municipalities to do the work that they need to do to keep our cities vibrant. Q: Let me just back up a little bit. You're saying you'd still be talking to this, if it changes its mind on LRT you'd still talk to the city about other transit programs they could use with that money? Horwath: Yeah, because, you know what, the, the reality is, the Province shouldn't be deciding what municipalities choose to do with their transit systems. I mean, there's, um, there's a plan in London for a bus rapid transit. They chose that over LRT. I'll be truthful: a lot of NDP activists in London wanted an LRT, but the city decided on a BRT. Their planners decided that, the people that they engaged in their decision making process and their public consultations, they decided BRT, so BRT it is. Ottawa is doing something different, you know, Toronto is doing something different. So it's not up to the Provincial government to decide how to solve the transit issues in a municipality. It's up to the municipality to decide. So to be there, though, as a funding partner to help realize those goals is absolutely important. Editor's note: RTH has a longstanding policy of not formally endorsing candidates for municipal, provincial or federal election. However, in the interest of disclosure, the author of this article has personally volunteered and donated to Andrea Horwath's campaign. I really liked the clarification message sent out about Andrea's strong support for the project. I do not believe LRT and any improvement to public transit can happen under a Ford government. If the NDP makes the government they are the ONLY chance we will have to keep this project alive. I hope everyone continues to remember that and the danger of Doug Ford style populism when they vote. Also do not forget LRT is one of a slate of progressive planks in the NDP platform that also includes, universe dental and prescription coverage. Personally, I dare to dream of a quick Phase 2 extension to Hamilton's LRT. 2007: Opposed Ottawa city council successfully cancels LRT with $177M penalty. 2013: "... Stage 2 LRT project was approved unanimously by Ottawa City Council..."
Fudge the years around by a few, but you get the picture when getting inspired by Ottawa's extensions as well as Kitchener-Waterloo's extensions. The full A-Line doesn't make business sense yet due to poor ridership of A-Line. Also, T-Line makes no sense either. But cut the A-Line & slap on the density T-stub, turn it into one LRT, and voila -- the correct recipe. Given the Waterfront densification plan & the Limeridge densification plan, this is the correct optimized Mountain Extension that would have a justified business case assuming the densification plans & bus ridership-building plans ends up proceeding. Long term I believe #WeCannotExcludeMountain -- I think it's potentially key to LRT survival. Maybe not. But very interestingly: I notice I turn around many mountain residents when I explain Ottawa (the "I hate the LRT because Mountain is excluded" residents) so telling "The Ottawa Phase 2 Story" can warm a bigger percentage to the LRT. The A and T lines can become separate LRT lines later (25 years from now) -- they will run as concurrent express buses, but with LRT overlaid on the density part (The more justified Waterfront-thru-Limeridge section). But the brand new mountain LRT route (A+T hybrid) is probably the best-benefits economically in a mere 12 years from now. That assumes, successfully picking up the pace on $500M of bus funding from $372M federal/provincial + city pitchin to ramp up the ridership properly while also doing a "just-in-case" EA of the AT hybrid from 2018-2022 for a "just-in-case" 2022 election funding of a justified-business-case AT hybrid. Especially after LRT opens in Ottawa and Kitchener-Waterloo (first modern-era cleansheet LRTs operationg) and riders give those some acclaim. If necessary, we need to be loud about Phase 2 during municipal election to remind residents about the truth that -- long term -- they aren't being excluded. A lot of lukewarm mountain residents actually love my idea -- not the ardently anti-transit types but the concerned types that are upset of mountain exclusion too (The "Why along B-Line first?" types). You see, this may actually be LRT survival's key. I was born in Ottawa. I lived in Ottawa. I witnessed the Ottawa LRT theatrics as an Ottawa resident. I'm telling you this now. Depending on how similarly the political stars align, Phase 2 may save the LRT. The politics is NOTHING new to me. Let's simply just have an EA ready. Just in case we're seeing densification booms & bus booms -- that the Waterfront/Limeridge plans become real too -- then Hamilton is fully prepared for 2022/2026 election funding of LRT extensions if all the justification checkboxes are all ticked This sends the correct positive message to the Hamilton Mountain. Phase 2 is realistic, with some optimizations.